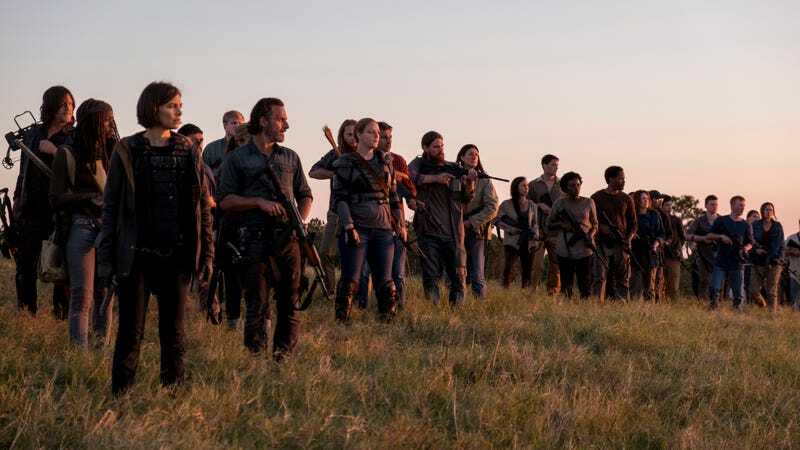 The cast of The Walking Dead looks towards a brighter season nine. I’ve been trying to think of an analogy for the back half of season eight all night, and best I can come up with is this: You have a crappy friend. He borrows money and never pays it back. He tries to flirt with your girlfriend. He asks to use your car and he brings it back with a dent, pretending like it was there all along. But one day, you need $100, bad, and this friend actually helps you out… and then he smugly acts like he’s the greatest, most generous friend who ever lived. But here’s the thing—when you absolutely needed that money, he still gave it to you. That’s “Wrath,” the season finale. It was the end the show—if not the audience—needed, but an end not even slightly justified by the episodes leading up to it. Plot-wise, it’s quite straightforward. Using the fake intel Dwight gave them, Rick walks everybody straight into Negan’s trap. They’re standing in an open field when Negan gets on the bullhorn and announces that the Saviors literally have them surrounded in a giant circle of guns. When Negan gives the order to fire, all the Saviors’ guns misfire because Eugene sabotaged the bullets he made them, the Kinghillexandrians attack and win and all the Saviors who don’t get shot down surrender, and Rick had his mano-a-mano fight with Negan, which I’ll get to in a second. Honestly, I’m willing to overlook the questionable decision for Eugene to decide to sabotage all the bullets after Daryl and Rosita have threatened to murder him, or why he didn’t explain his plan to them when he was captured, or how not a single Savior fired a single bullet prior to the attack, but all of them—all of them—fired exactly simultaneously so they lost all their guns and got wounded and basically Team Rick was totally fine. I’ll overlook it because the war is finally over, and that’s a very good thing for this series. Rick and Negan, of course, end up in a fistfight (with occasional, inconsequential Lucille action) where Negan, despite having a major hand wound from his misfiring gun, manages to bring Rick to his knees. Rick scrambles, pitifully, and begs for 10 seconds to talk about Carl’s vision for the future, for Carl’s sake. Negan rather inexplicably agrees, and, also inexplicably, seemed genuinely moved by Carl’s words of peace as uttered by a man who was trying to murder him five seconds previously. That’s when Rick slits his throat. I’ll give The Walking Dead full credit for this: I genuinely thought Rick had murdered Negan. I genuinely thought that the show was so far gone that it wasn’t even going to try to redeem Rick, that it was fine with him using his dead son’s wishes for peace in order to trick people into giving him an opportunity to murder them, just like the characters on the show have been fine with Rick’s actions. Granted, a large part of my belief was because Rick visibly slits Negan’s throat with a shard of glass. Negan’s alive, but his way of doing things is over. And anyone who can’t live with that will pay the price, I promise you that. And any person would would live in peace and fairness, who would find common ground, this world is yours, by right! We are life! That’s death!” (points to gigantic zombie herd in the distance) “And it’s coming for us, unless we stand together. Go home, and then the work begins. The new world begins. All of this—this is just what was. There’s gotta be something after. Rick (Andrew Lincoln) and Baby Carl, seen doing a hell of an Andy Griffith and Opie cosplay. Although stirring, it’s a rather awkward speech to hear after all the crap he’s pulled the last eight episodes, and Rick’s redemption here is just spectacularly unearned. Remember, 60 seconds before he gives his inspirational oration, he literally slit Negan’s throat. And he tricked him to do it, by distracting him with the promise of a new peaceful world that, 60 seconds later, Rick suddenly believes in with all his heart. In terms of the narrative the show has followed, Rick should have murdered Negan. Remember, Rick was lying to and murdering people who didn’t even want to be Saviors any more two—two!—episodes ago. The only thing that’s changed since then is that he read Carl’s letter, and I don’t care who disagrees with me, but the fact that the letter inspired him to stop being a cold-blooded murderer and work for a better world as opposed to his son literally saying the words to him as he died in Rick’s arms is nonsense. It’s terrible writing, and it was obviously done just to pad out the second half of season eight so Rick’s redemption could be saved for the finale, which makes it even less meaningful. What’s worse is that this awfulness could have so easily have been avoided. All they needed to do was kill Carl the day before the final battle so they could inspire Rick to spare Negan, as opposed to inspiring him to show no mercy for half a season. I mean, my god, even Morgan—who is so crazy that he attacks and nearly kills little Henry—tells Rick it was messed up that he lied to those people in the bar in order to murder them. But again: As bad and unearned as it was, we’ve still finally gotten a Rick who does want to make a better world, who does want to follow his son’s dying wishes, who has hope for the future. Whatever crap we’ve had to sit through to get here, I really needed that $100, guys. Still, I don’t want to get too crazy with praise for Rick the Redeemed. When Negan wakes up in a makeshift hospital room, Rick and Michonne inform him he’s going to be a sign, for the new world, evidence that civilization can exist, by being locked up forever for his crimes. It’s exactly what needs to happen—to show people that “mercy prevails over my wrath”—but Rick does threaten to take out Negan’s neck stitches less than 30 seconds before promising the former leader of the Saviors that “we’re not going to hurt you,” so... baby steps. Of course, not everyone agrees that imprisoning Negan is exactly what needed to happen, chief among them Maggie, who is quite upset when Rick announces he’s sparing Negan’s life (some very good upset acting by Lauren Cohen there). She can never forgive Negan for killing Glenn, and now she’s sinisterly planning to bide her time for her chance to “show” both Rick and Michonne that they’re “wrong.” And she’s enlisted Daryl and Jesus into her plan. I don’t really know why AMC made this odd photo of Jesus (Tom Payne) awkwardly kicking a dude available, but it made me snicker. While it’s a little annoying that The Walking Dead couldn’t just leave it be and end on a wholly non-pessimistic note for once in its run, that’s what the show is. I get it. And while it’s irritating that the dissension has to come within Rick’s most trusted ranks, at least this makes total sense for Maggie’s character. No complaints here; technically Negan killed Glenn less than nine months ago (she was pregnant then, too) so she’s still mourning, and by taking control of Hilltop she’s become a tough-as-nails leader on her own accord—why should she just blindly obey Rick? But if you can explain to me why Daryl is in cahoots to “show” Rick and Michonne how “wrong” they are for sparing Negan when he literally spared Dwight mere minutes prior (giving him a car, and sending him into exile) I’d love to know. And even if you can do that, you can’t possibly explain to me why the hell Jesus is in on this plan. Jesus is The Walking Dead’s Prince of Peace and he’s been pro-sparing everybody since day one; there’s no way he’d be okay with trying to kill Negan after he’s been imprisoned. And before you tell me he’s secretly there to thwart Maggie’s plan and save Rick et al., why has Maggie included him in her little revenge mission at all? I repeat: Jesus has been pro-sparing everybody since day one—she could not pick any character less likely to support or carry out her revenge. It makes less than no sense. In the end, The Walking Dead got where it needed to go; it was just an awful, meandering, and often boring journey to get there, and for Rick to finally start the swing back from cold-hearted killer to protective leader again. It’s a pendulum that’s been swinging back and forth since the show began, but hopefully this time we’ll get to enjoy Rick being a good guy for an entire season—with all the Savior junk out of the way and new showrunner Angela Kang, The Walking Dead can finally start telling a new story, albeit one that’s probably also about a new group of murderous jerks who have decided to spend the zombie apocalypse tormenting the living. If Rick can actually make a world I care about being safe—and The Walking Dead can make Rick a character I care about again, period—well, that’s worth a hell of a lot more than $100. This is a very pretty photo of a zombie. Well done, Gene Page. • If you want a sign of how much this season has been spinning its wheels, take a look at how short the “previously on” segment it. There’s not much you need to know going into the episode. Not much at all. • If someone wants to cut Rick’s flashbacks to walking with little Carl with The Andy Griffith Show theme song, you’ll be doing the world a favor. • I’d be okay with a Maggie-Alden romance. • You all know I’ve talked a million times about how much less awful Rick is than Negan, but Negan ordered some of his men out to die as bait, and that’s definitely something Rick never did. • So Jesus tries to save Morgan, primarily by asking him to use the pointy end of the stick for zombies, and the dull end for the living. He seems pretty stunned by this concept. • Actually, Morgan goes from being batshit-nearly-murder-a-child crazy to being basically sane but needing a little “me time” based on that talk with Jesus and Rick’s sparing of Negan, and it’s garbage and utterly unearned and I am happy to see the character go deal with Fear the Walking Dead. • That beyond-enormous zombie horde that the battlefield has such a great view of: Were they there just to helpfully provide a visual for Rick’s speech, or are they going to be a factor next season? I would be pleasantly surprised to watch these guys just fight zombies for a while. • American Express doesn’t want you to go full Shane without its credit card, so keep that in mind, guys. • Whenever I get to Assorted Musings, I look back through my notes so see whatever odds and ends I want to mention. I have just seen my note that Oceanside helps Hilltop by throwing a bunch of Molotov cocktails at a little Savior attack, which is so meaningless I had completely forgotten all about it. So glad we spent all four minutes with Aaron this season to end up with this jaw-dropping twist. • Morgan stops by the Garbage Dump to tell Jadis she’s invited to the communities, and, after revealing her name is Anne, she leaves Morgan behind. So… what the hell is the deal with the helicopter? And why is she cool just leaving her meeting place with it behind? Was the trip she missed a one-shot deal? • Rick and Negan’s fight happens by a tree in the middle of a very, very large, open field, and the tree has two giant stained glass windows hanging from its branches. I’m optimistically going to assume this is not total insanity on behalf of the showmakers, and is something that someone actually does for some reason, because otherwise a tree having random windows just to give Rick something to slice Negan with would literally be the most contrived moment of television I’ve ever seen. But I can’t begin to imagine what is happening here.